The time came for us to stop relying on our oral history and put the First Light story down on paper. Last Spring, we looked ahead to celebrating the ten year anniversary of moving into our building in a special way: a book that tells our history and more importantly, our story. The economic and political culture of Birmingham in the 80’s was such that individuals were once again being called to a greater awareness of the social problems of their community. The downtown business and church communities found themselves face to face with homeless men and women sleeping in their courtyards, digging food from their dumpsters, seeking shelter in their store fronts and back alleys. It made us feel uncomfortable, perhaps, but there were those who knew how best to respond: with compassion and love. There are too many people to recognize and thank here for their willingness to take risks and to step out in faith to provide some solutions to meeting the challenge of helping the homeless in Birmingham. Our book is an attempt to give witness to those individuals who responded with “I will go” when asked “whom shall I send?” Most importantly, Love at First Light is a testimony about women and children who looked to us for help because they desperately needed it. Moreover, it is a statement of praise to all our guests…from the past to the present, who have shown us indescribable stamina and hope in the face of perils and obstacles most of us will never know. Ellen Dosset, Ph.D., local educator, psychologist and author of Just As I Am: Americans with Disabilities, was asked to pen the story. Ellen has interviewed people who were there at the beginning when First Presbyterian Church offered its basement as a temporary night shelter for women and children. She has spoken with early volunteers who came with food and spent the night…when you had to go to the security guard at the Birmingham News to unlock the door! From current staff members, to Miss Jeannie, long time residents and current guests, to those people who served on the capital campaign to renovate the old Granada Hotel, Ellen has discovered a story rich with purpose, love and dedication. We have told her First Light has been surrounded with grace since its very inception. She has seen and heard why the story is so important. From creating hospitality and a safe place in a basement for 15 women and facing 30 who came, to the decision to create a more structured environment and place where social services could be provided that would truly have a deep impact on lives...it’s all there. Interestingly enough, we are back in the same situation—the second floor is no longer enough space for all those who come and we are sleeping women and children on the floor again. History repeats itself. Wynter Byrd, a nationally recognized photographer and former First Light employee and volunteer, has done the photography for the book. Wynter knows First Light—she “gets” it, and she knows how to tell a story with pictures. We came in some mornings to learn she had been here at 6:30 AM to capture images of the women preparing for their day. She made dinner for 4th floor residents to renew her relationship with them before taking their pictures. She has visited our former guests in their apartments, taken pictures of the building from on top of the YWCA….she is very enthusiastic about her work! 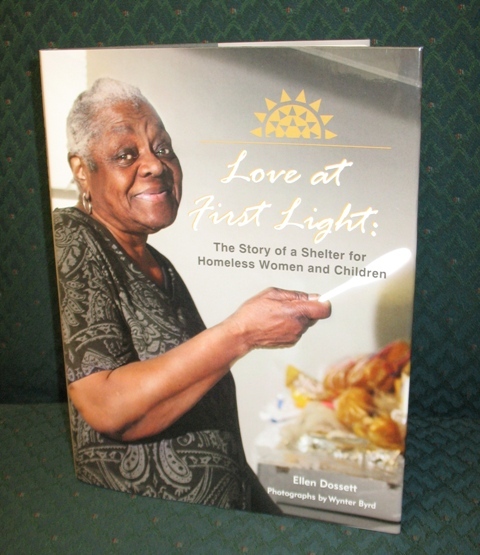 The proceeds from the book will go into our endowment fund - to keep the love and light coming for all future guests! Truly, the story needed to be documented and shared. It is pure grace and guts that took a dark and dank basement and converted it into a place of light and life and hope. And then years later, made it happen again, by taking an abandoned hotel being used for bad habits and prostitution and turning it into a residence and life-giving center for homeless women and children. Anyone who has had anything to do with First Light knows it is a powerful story. They will most likely agree that it has improved the lives of many women and children, and truth be told, all those who have volunteered, contributed and worked here over the years. Love at First Light is now available for purchase. You may purchase copies of the book by either dropping by the office between 8am and 5pm Monday-Friday, or by purchasing online here. For more information, please contact Deb Everson at (205)323-4277 or deborah.everson@firstlightshelter.org.